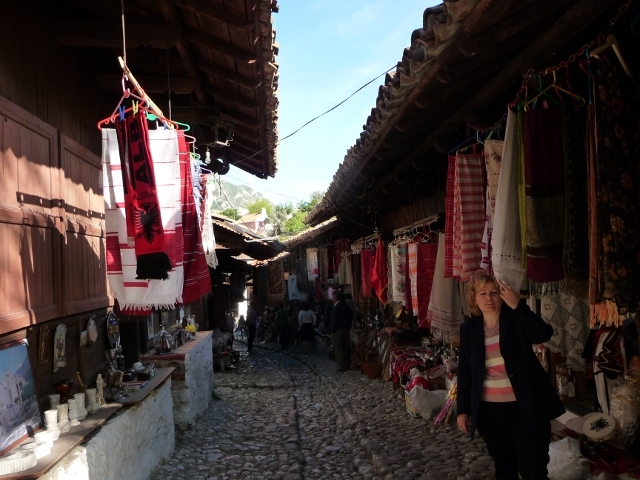 Kruja was the first bit of proper full-on tourist industry we’ve really come across in Albania. Apart from the nearby hotel which advertised camping (sauna and pool included – but migawd, you were paying for ’em! ), we were guided into a parking place in town by a nice man with a very official looking, if dog-eared and illegible, laminated badge around his neck who seemed to be claiming parking would cost us 100lek per hour… While we sorted ourselves out and tried to ignore him, he got bored and wandered off, leaving us to sneak off towards the castle while he wasn’t looking. The route from town to castle takes you through the old bazaar – a wonderful cobbled winding row of simple and ancient-looking wooden shacks, roofs virtually meeting in the middle. At least, that’s how it’d look when everything was closed up. Which they weren’t. Every one of the shacks was open, with the unsuspecting tourist assailed by cries in most major and a few minor languages entreating you to come on in and spend money with them and them alone. Goods available ran the full gamut from t-shirts to hip flasks to antique furniture to rusty rifles to Mother Theresa paperweights to hand-woven scarves and ice creams. 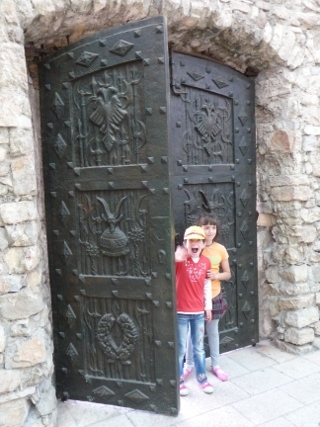 We managed to get to the castle with wallets unscathed, and took a look around us. There’s not a lot left of the original castle – just the outer walls and some foundations inside, together with a Venetian tower on one end, and some older houses. One of these houses is another Ethnographic museum, very similar to those we’d seen elsewhere, whilst just down the hill from there lies a tiny Bektashi Tekke, restored and still run by the current senior member of the clan who’ve run it for years, and are even reputed to have converted Ali Pasha Tepelena, who we’d “met” several times already – all the way from Butrint to his playing host to Lord Byron. At first glance, though, the castle walls look to still contain the keep, in remarkably well preserved order. Then you realise that it’s a modern pastiche – built in the early ’80s by Enver Hoxha’s daughter and son-in-law (also responsible for the Pyramid in Tirana) as a Skanderbeg museum. The party obviously wanted to sign the 15th century bane of the Ottomans up as a fully-fledged member, to get some of his glory and heroism to rub off on them – and the museum really does take the whole personality cult thing to a new level. 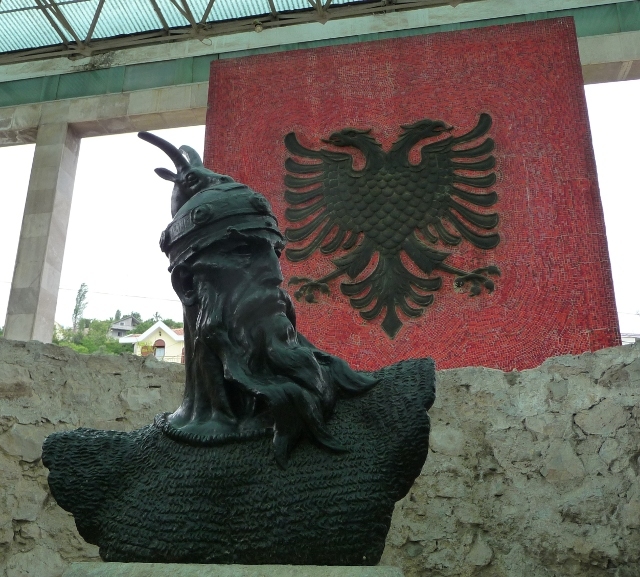 It’s hilarious, tacky and cheesy, from the two-story-high sculptural tableau in the atrium through to “Skanderbeg’s desk” with “Skanderbeg’s correspondence files” sat on it, and with a huge stained-glass picture wall illustrating one of his battles. After that lot, we needed a change of scene – so fought our way back through the bazaar (gaining ice creams, t-shirt and scarf en route, but managing to avoid the rest), back to the van (without any kind of parking ticket or other demand for money) and headed up a tiny, steep winding lane through the back of the town centre, which soon turned into a high-quality and excellent condition road up a serious mountain. At the top, where our map showed the pass continuing over to some other villages, there was nothing – just a car park at the back of a slightly abandoned-looking hotel and a path down to a small bar, together with a very military looking set of aerials guarded by a man in a uniform with a large gun… A couple of bends down the hill, there was a sign off to a restaurant, via a dirt track which might have continued past and down the other side of the mountain. The restaurant was surrounded by rolling grasslands, with dozens of picnicing families – all sat, cheerfully on rugs, surrounded by piles of rubbish. One story we’ve heard is that litter was very seriously penalised by the communist regime, so the freedom to leave all your junk blowing everywhere has been eagerly picked-up as part of the new freedoms. Whether this is true or not, I have no idea – but any “Keep Albania Tidy” signs that might be put up would very quickly be invisible behind bottles, cans and plastic bags. Still, we found a very pleasant layby right on the road, where we watched all the picnicers return to town, some on foot despite town being 10km of road and 1000m of altitude away, most in massively overloaded cars and trucks before we settled in to another night of peace and amazing views. The next link north in the chain of castles is at Lezhe. 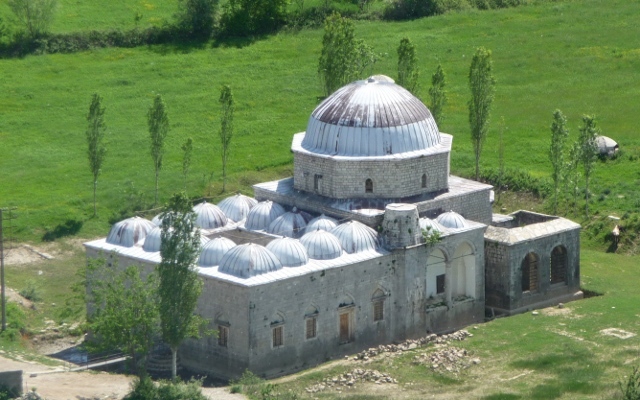 Another centre of the Skanderbeg industry, this is much lower-key… His tomb sits in the ruins of the small and simple cathedral. The church walls sit about six or seven foot high, underneath an oversize modern steel free-standing roof. Bronze shields line the walls of the cathedral, commemorating his major battles, with the tomb and a large bust at one end overlooked by a huge mosaic of his double-headed eagle standard, now the country’s flag. 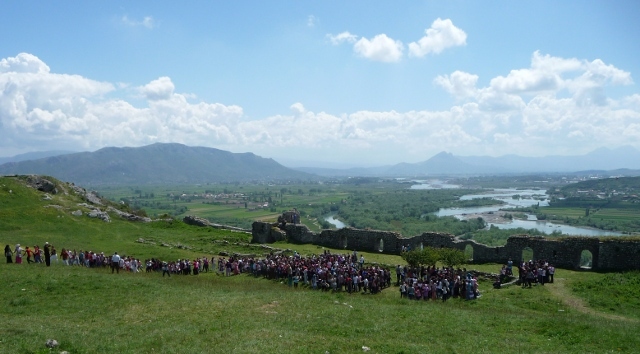 A little further north, approaching the main northern centre of Shkodra, and we stopped off at Camping Albania. 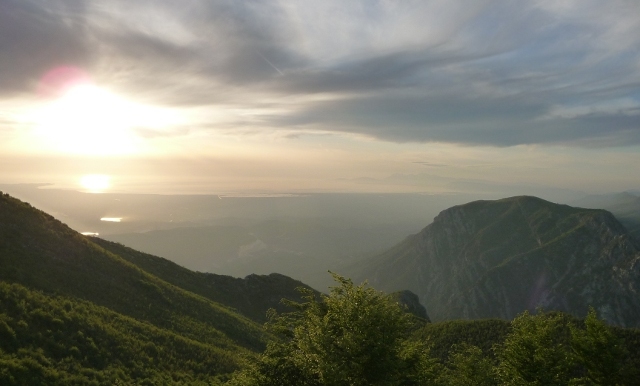 The first campsite to be opened nationally, a few short years ago, it’s run by a Dutch family who came out in the early ’00s to work in aid and development projects, but found they were playing host to more and more travellers – so why not formalise it? We’d had high expectations – and the facilities lived up to them. However, there seemed to be something missing. There just wasn’t the enthusiasm and vibe we were expecting. 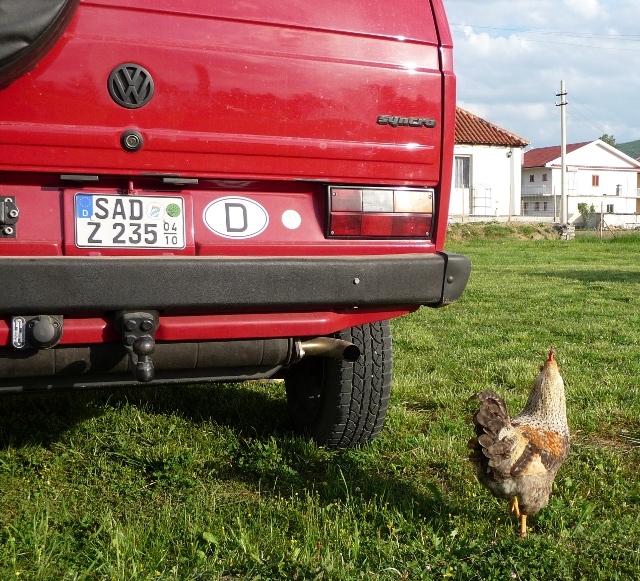 When we arrived, the camping field was completely empty – apart from umpteen curious chickens, although they seemed unable to assist with our need for a couple of eggs. It wasn’t long before others started to arrive, though – starting with Hannes with his VW camper, very similar to ours – except his was the very desirable 4×4 Syncro version – just the thing we could have used on several occasions. Rozafa Castle was our introduction to Shkodra, with the amazing views in all directions you’d expect of the location – at the confluence of three major rivers and on the bottom corner of the large lake which forms a good chunk of the border to Montenegro, and with the beautiful (if boarded-up) “Lead Mosque” sat nestled gently on the plains at the foot. 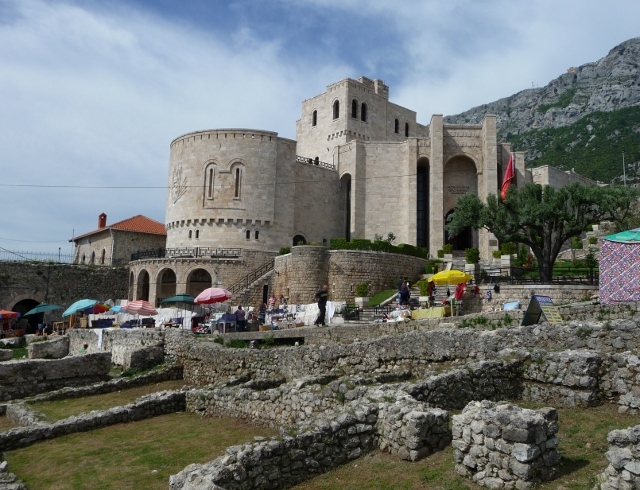 The castle itself seemed to be playing host to visits from about three quarters of the entire Balkan school-age population, and we just managed to get back to where we’d left the van parked half-way up the steep entrance road before the throng descended en masse to their waiting buses. Once we found the centre of town, no easy matter given that every single road has been renamed or is suddenly and without signs closed due to roadworks – or both – it had a very laid-back and Mediterranean feel, very different from the rest of the country with long lines of pavement cafes. As with Tirana, though, food seemed to be in short supply at the cafes. At the one which did have a menu outside, we were quickly dragged away from the street table we’d been about to sit at, and ushered up to the first floor terrace. We’d only been intending a smallish lunch, but were tempted by the Shkodran speciality of lake carp, in this case baked in a sauce – delicious, and a huge portion. After that, we needed to wander around gently to recover a bit before heading on, so tried to find the Marubi Phototheque, the archive founded by the first person to take a photograph in Albania. Together with the work of his direct descendents, the archive documents much of the last 150 years of this fascinating country – once you actually manage to locate it. Our guidebook said it was in a “difficult-to-locate” alleyway, and gave a rough location on the map. This turned out to be incorrect, though, and their suggestion of asking a local was quickly brought into play. The first few pointed us in various directions but to no avail. One lady, running a clothes shop and possessor of the most amazingly unconvincing set of painted-on eyebrows we’ve ever seen, pointed in a completely different direction which we both understood differently. Finally, we asked a woman running a newspaper stall – she despatched her identically dressed identical twin daughters to lead us straight to the door… The collection on display isn’t large, but it is fascinating – from illustrations of traditional dress to a portrait of King Zog and his sister, to various historical events – either “live” or reconstructed later in the studio. The archivist who was giving us a guided tour and working our Italian hard was soon interrupted, though, by an effervescent 20-something who explained in English that he was the director of the archive and a total Anglophile. He loved English football, English television and music, even our National Anthem… He also explained a bit about how the archive is trying to get their material more widely seen, starting with a move in a few months to new and larger premises. We didn’t suggest that maybe a few signs would be a good start. Our final stop in Shkodra was the tourist information hut – again, not quite where our map suggested it was – where we were given the news that the road to Theth was very much do-able without a 4×4 (contradicting the one piece of concrete information we’d been given at Camping Albania), but that the Komani ferry was not currently running… and that was precisely where we were planning to head next. This entry was posted in Art & Culture stuff, By Country - Albania, Food stuff, Personal stuff, Travel stuff. Bookmark the permalink.